Disclosure: This is a cookbook review for a fellow food blogger. 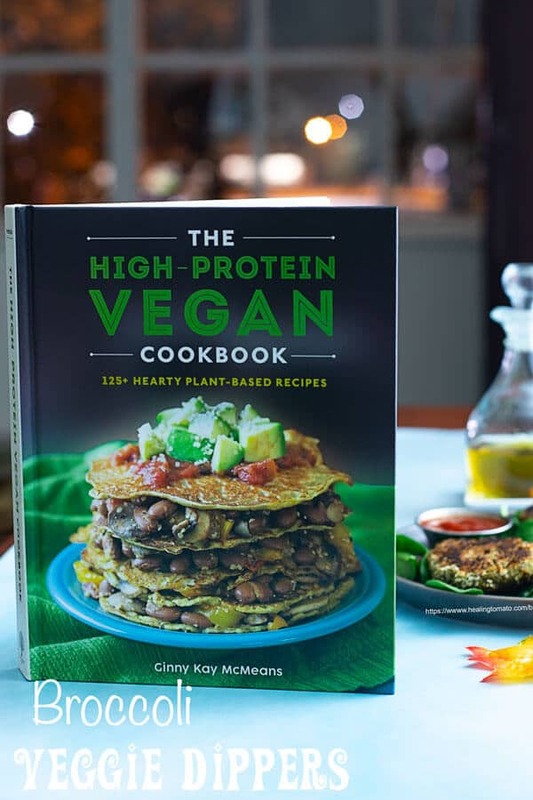 Ginny blogs at “Vegan in the Freezer” and her new cookbook is “The High-Protein Vegan Cookbook” which is available for purchase via (affiliate link) Amazon. I received an advanced free copy of this cookbook for review. I finally found a vegan protein recipe that I can eat every day! 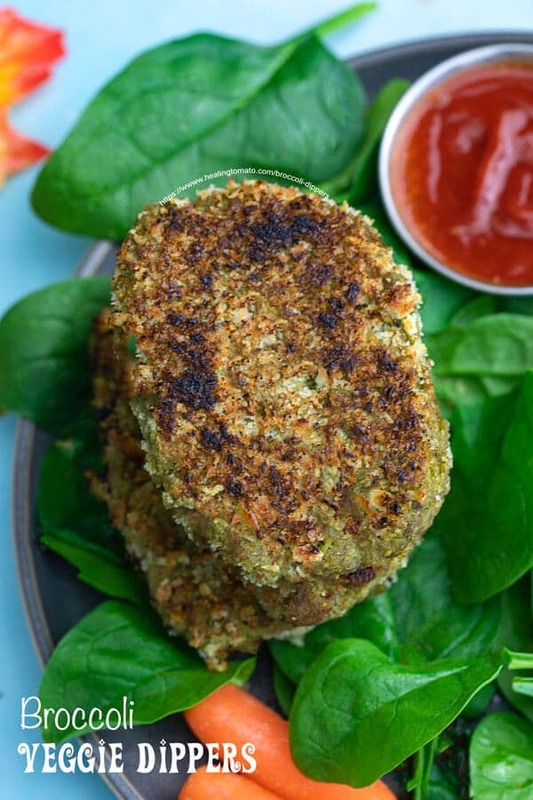 These vegan broccoli veggie dippers are so easy to make (took me less than 30 min) to make. I was also able to use them in meal prep recipes and enjoy them all week! The broccoli and lentils are a match made in delicious vegan heaven! – This recipe calls for steamed broccoli and cooked lentils. I used my pressure cooker to steam the broccoli and lentils at once. For me, this is faster than the stove top method recommend in the recipe. But, both methods are effective because the broccoli and lentil are cooked to perfection. – Make sure that the heat is set to medium high and keep it there. The first time I made these as a test run, I kept turning the heat up and down because the pan was getting hot. That made the broccoli bites cook unevenly. 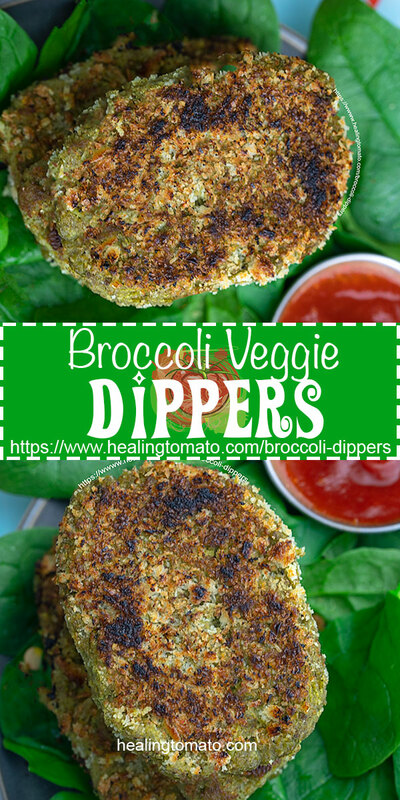 – These broccoli dippers are delicious by themselves. I liked putting them into a pita bread, with spinach, Muhammara (or hummus), onions, vegan feta and pickled tomatoes. This makes for the best lunch recipe ever! 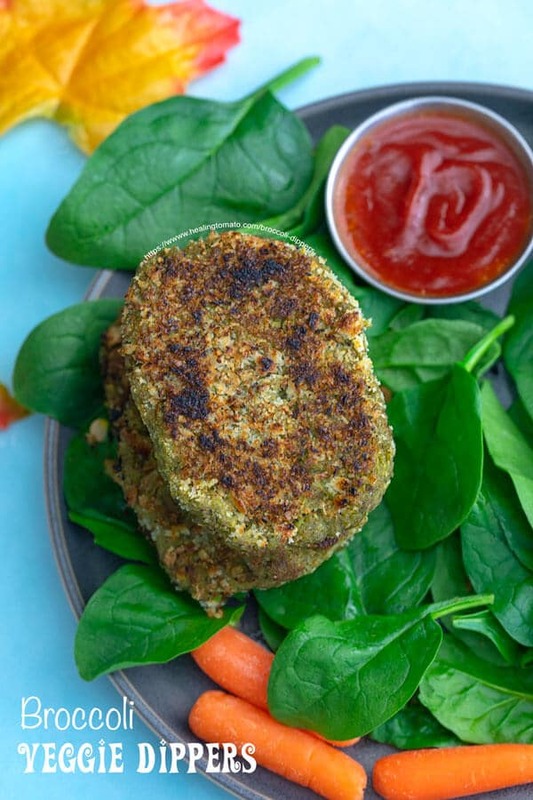 Ginny’s cookbook has over 125 recipes full of protein and delicious goodness. She also made sure that the recipes are quick and easy to make using simple ingredients. That’s what I love best about her book. 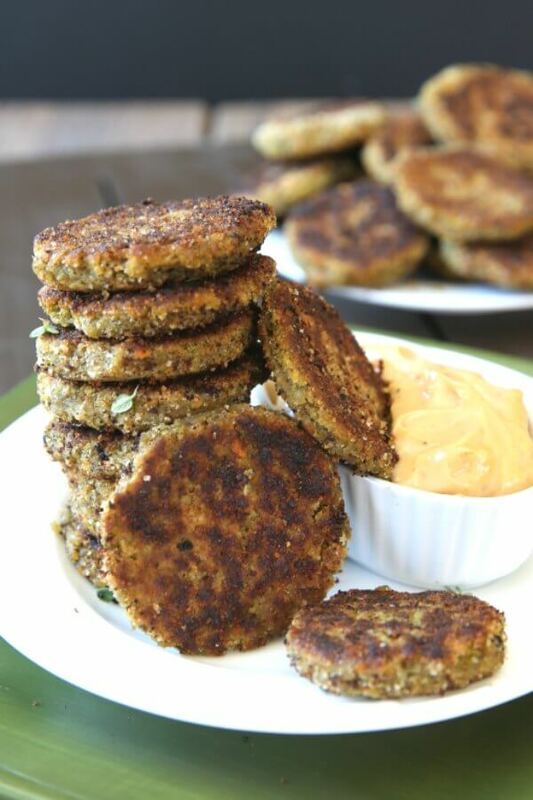 She has vegan appetizers, breakfast recipes, lunch bowls and sandwiches, fun snacks and hearty dinner recipes. The last chapeter is dedicated to the making of seitan which is a good way to get even more protein into your diet. Chia egg is a quick vegan way to get all the properties of an egg. It acts like a binding agent just like eggs. As you know, vegans don’t eat eggs. Its consider a potential life form and its also an animal by-product which makes them sacred for vegans. So, its common to use egg subsitute or egg-like ingredients in recipes. 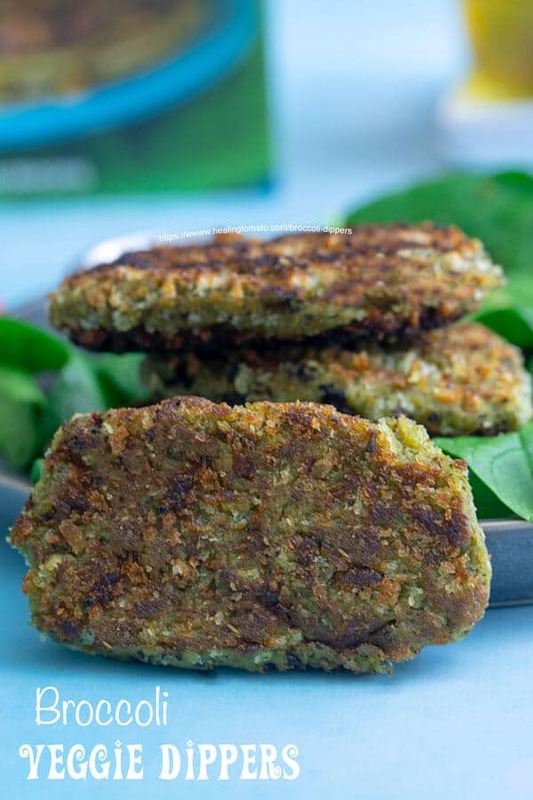 I have always used flax eggs which is made of 1 Tbsp flax meal to 3 Tbsp warm water. 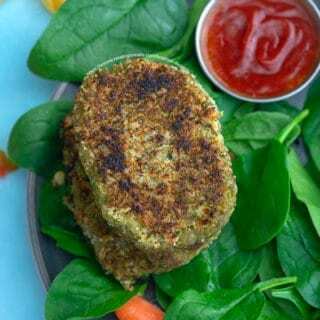 Ginny is using ground chia seeds in the same way and they end result is one well put together broccoli dippers. If you don’t have ground chia seeds, grind regular chia seeds in a coffee grinder. Check out my complete guide on what vegans don’t eat. Did I miss an ingredient? 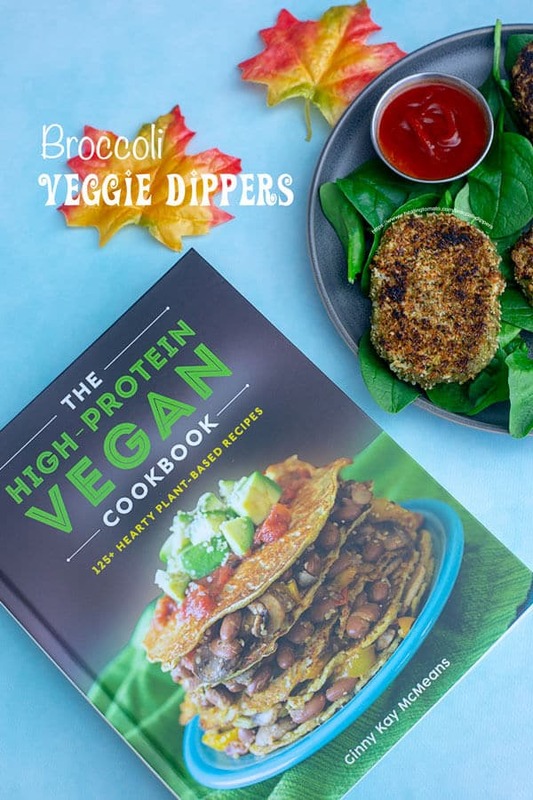 – She serves these broccoli veggie dippers with a (affiliate link) vegan chipotle mayonnaise which is really delicious. So, what’s your favorite vegan protein recipe? Get your vegetables the fun way. These dippers are small patties that you can pick up with your fingers. Eat them plain or dip them into your favorite sauce. Party food! Place the lentils in a medium-large saucepan and pour in ½ cup water. Place the pan on high heat and bring to a boil. Remove from steamer, drain excess water and set aside. What a fantastic review. Now you’ve made me hungry and I need those dippers. Thanks so much for the great job and your photos are beautiful! Thank you, Ginny! Your book is AMAZING and all the recipes make me drool.